Housing Developments: Party for Prop 1! 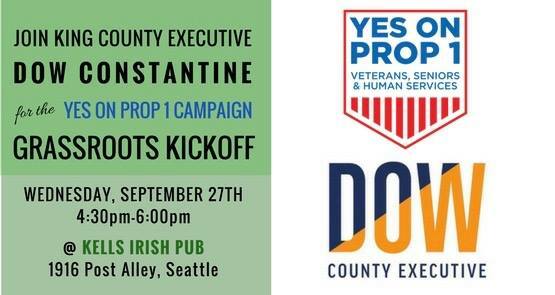 The Yes on Prop 1 Campaign to Renew the Vets, Seniors, and Human Services Levy kicks off this Wednesday! Can’t attend? You can still help the campaign by telling us why you support the levy, or how it impacts your personal or professional life with this super-simple story sharing survey or you can officially endorse the campaign. Tim Burgess has been sworn in as Seattle’s 55th Mayor, leaving the remaining city councilmembers with a vacancy during a critical budget period. Council President Bruce Harrell proposed a plan to fill the vacancy on October 6th. If your bid for interim city councilmember is unsuccessful, consider applying for one of two open spots on the Seattle Planning Commission. Redmond’s planning commission also has an opening. The MHA-triggering Uptown rezone moved out of committee last week. The rezone, along with proposed Design Review changes, now move to full council. Issaquah councilmembers voted to approve the city’s Housing Strategy Plan last week. Meanwhile, one property in the city takes an unexpected step towards potentially becoming affordable housing. One Eastlake renter profiled by the Seattle Times pays a lot more for a lot less these days. A tie is a loss for SOID advocates in Burien, where the city council voted 3-3 on directing city staff to explore source of income discrimination protections for renters. Auburn Mayoral candidates debated solutions for people experiencing homelessness in the city, while community members help each other in creative ways. Kirkland City Council candidates talked density and affordable housing at a forum last week. The Seattle Housing Authority received the Affordable Housing Finance Magazine Readers’ Choice Award for Best Public Housing Redevelopment for Raven Terrace. You can congratulate SHA at the ribbon cutting ceremony for Hoa Mai Gardens this Friday. Building Transit, Building Opportunity: Puget Sound Regional Council event on Wednesday, October 11th. This regional event will explore innovative techniques and best practices in creating successful transit-oriented communities affordable to all.What did we miss? Email us with suggestions.